Face to Face with Jim Kennard in the garden! Whether you grow in the soil or in containers, this great resource will SHOW you how to have the most successful garden, AND help others grow their own food. The Gardening Seminar DVD/CD was produced by Jim Kennard, and has just been updated with an additional excellent video! 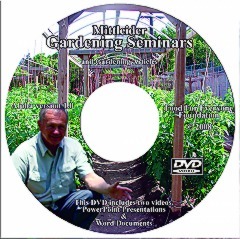 The Seminar DVD/CD includes a 1-hour video of Mr. Kennard actually creating both soil-based and container gardens. Another video teaches the Six Laws of Plant Growth, and the third video also teaches the Six Laws, but is quite different than the first one, and is highly recommended watching. In addition, there are 4 PowerPoint presentations used by Mr. Kennard in conducting workshops and seminars, plus several valuable Word documents on gardening. This is the same material Mr. Kennard uses in conducting Gardening Seminars and Workshops all around the USA. Highly recommended for those serious about learning – and especially for anyone who will be assisting or teaching others.